Public meeting at Moffat Town Hall, Thursday 24th January, 2019. Beattock Station Action Group has been campaigning for the re-opening of the station since 2012. It’s been a long, frustrating and often very political struggle, but now we are in the final stage of the Transport Partnership for Dumfries and Galloway (SWesTrans) Sustainable Transport Options Study for Moffat, Beattock and the surrounding communities. opportunity for us to turn up, and give our own, personal reasons for wanting Beattock Station to be re-opened. 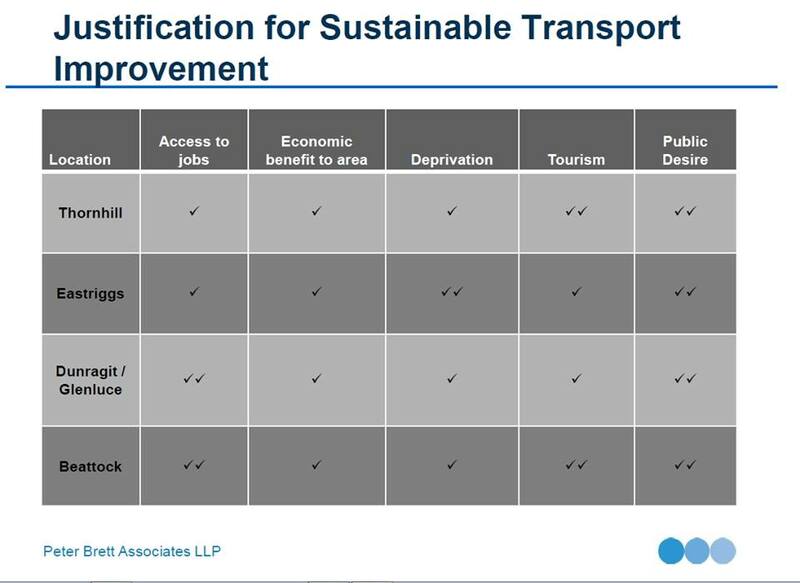 Scottish Transport Appraisal Guidance (STAG). an informal discussion with our team. options developed and how they may impact you. 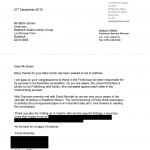 The presentation given to the Scottish Government’s Transport Minister by the Action Group and students of Moffat Academy. The notes for each of the Academy pupils follows below and the visual presentation is at the end of the notes in the form of a downloadable powerpoint presentation. Beattock is uniquely placed – at the very north of Dumfries and Galloway – but slap bang in the middle of the country from east to west. It is just 2 miles from Moffat – a popular destination for tourists. Nearest cities are Glasgow, Edinburgh and Carlisle. The stretch of rail track going through Beattock is in the longest length of track in the UK with no station – people from our area therefore have to travel to access a train service. If the station was reopened it would have a major impact on the local population but especially young people as the major Scottish cities would be only 45 minutes away. Currently our closest station is at Lockerbie – around 15 miles away. The service from Lockerbie is good but the lack of bus services linking in with the train times means that there is often a long wait to access a train. This is especially true in bad weather – as we saw from the snow last week. For people with cars it is easier although Lockerbie Station has very limited parking and the neighbouring streets are always congested causing disruption for people living near the station. Reopening Beattock Station would alleviate that problem. If Beattock Station reopened it could have an enormous impact on young people accessing further and higher education. 65% of pupils from our school go on the further study with the majority aiming for places at institutions in Glasgow and Edinburgh. Having a direct rail link would mean easier journeys for students and for the first time would open up the possibility of students staying at home while studying in the city. Given the high cost of halls of residence this would be especially beneficial for students nervous about living in the city and for students from less affluent families worried about the financial implications of further study. Drop out rates are high and for some students the opportunity to remain at home while they transition to student life could make the difference. If Beattock Station were to reopen it would also be important for the local economy of the area. Moffat is an important tourist town with many people employed in the local shops, hotels, cafes and restaurants. Opening a station would bring more people in to the town securing jobs and bringing prosperity to the local economy. Recently statistics showed that Moffat has one of the highest proportions of people who are self employed. Improving transport links would encourage other entrepreneurs to base themselves here knowing that they are in close proximity to the cities should they need it. The Borders railway showed how important the reopening could be for tourism – with 8% increase in employment linked to tourism being achieved there. Moffat has a thriving tourist trade with many key events on the calendar. These include events such as the sheep race, the world gold panning championship and the vintage car rally pulling in visitors. At the moment all these visitors have to come by car or bus. If the station reopened with shuttle buses to Moffat it could bring in even more visitors. For young people opening the station would help end feelings of rural isolation. Mental health is a huge issue just now – especially for young people – and young people in our area are no different. Some people in our area are dependent on alcohol or drugs and unemployment is also an issue. Being able to access life in the city may help some people see that there are other possibilities out there. People would be able to access the full range of events on offer in the city. This would include sporting events like big football matches, rugby internationals, Commonwealth games etc Music and theatre venues would also be opened up e.g. the SSE Hydro. We have talented young people at Moffat Academy – for example we have national champions in gymnastics – opening up the railway would allow elite athletes and musicians to access world class facilities and training programmes in the cities. We think the reopening of the station could be really important to open up opportunities for young people wanting to access student life, it could transform the local economy and create jobs and it could improve the quality of life for young people in the area. With your help we hope that the success of the Borders Railway could become a reality for Beattock too. Thank you. The SWestrans Board’s final decision, having dismissed Dunragit as an viable option, was that the three remaining priority stations, Beattock/Moffat, Thornhill and Eastriggs, would move to the next stage of the process (i.e. Scottish Transport Appraisal Guidance part 1). The Board meeting on 15th July deliberated the options, following a presentation where opportunities and problems were explored for Thornhill, Eastriggs, Dunragit/Glenluce and Beattock/Moffat station reopening’s. This included an analysis of each of the independent pre-STAG reports which had been prepared by Peter Brett Associates. The estimated cost of this, for each station, was in the region of £15000 – £20000, and it would fall to Dumfries & Galloway Council to provide the resources and finances to move this on, as part of D&G Council’s ongoing bid for funding from the Scottish Government’s Scottish Station’s £30 million fund for southern Scotland. 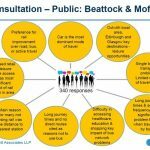 It is so good to know that Beattock’s reopening is now on a level playing field with Thornhill and Eastriggs for the next stage of the STAG process, and that SWestrans will provide the resources practical and financial to move this on (subject to Council Members’ approval re finances). For all three stations this is the first tick in the box to enable access to the Scottish Stations Fund for our region, and well done to Peter Brett Associates and SWestrans for facilitating this. It was also good to have Network Rail represented at the meeting. The WILL to change things for more sustainable transport options continues. 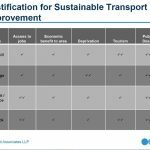 Scottish Transport Appraisal Guidance pre-stage report finalised. 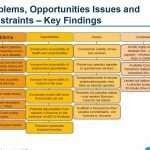 The STAG provides the mechanism by which potential options to address evidence-based transport problems or opportunities are identified and appraised in a consistent manner. 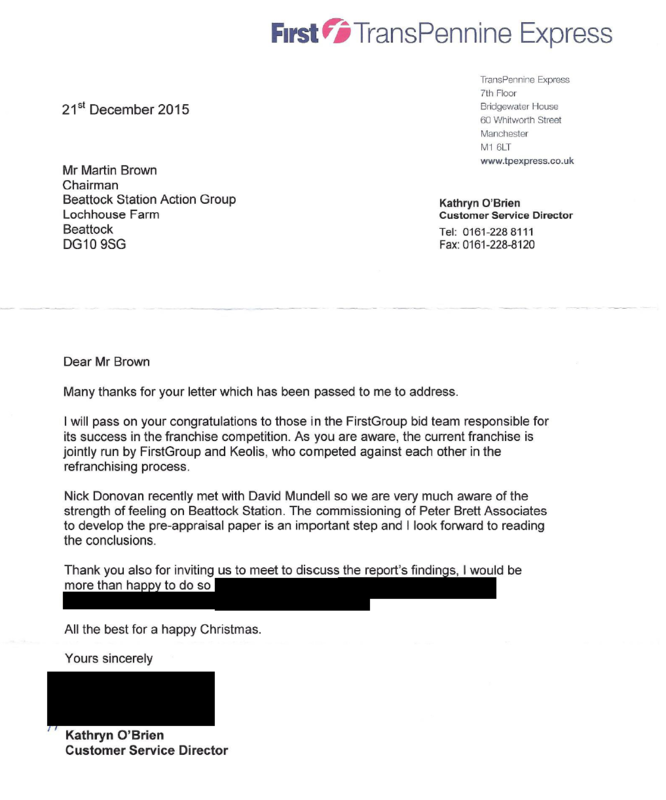 TransPennine Express have given a positive written response to the news of the independent pre-appraisal study recently agreed with Swestrans supporting Beattock Station Action Group. The communities of Beattock, Moffat and the surrounding areas have taken the crucial first step towards reopening Beattock Station. 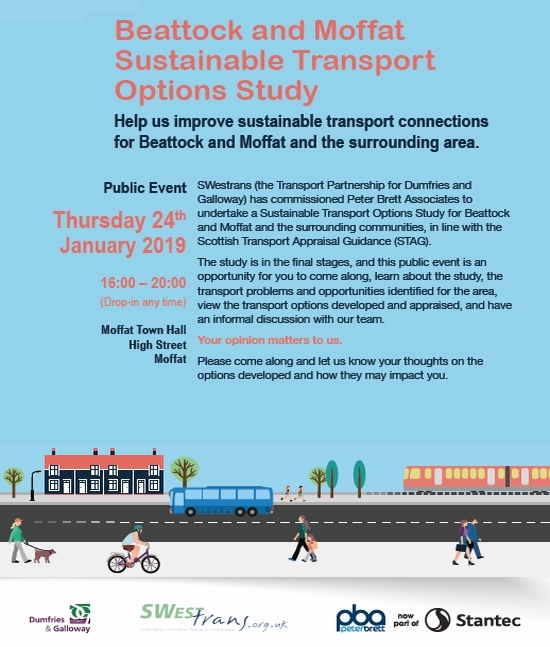 Beattock Station Action Group has joined forces with SWestrans, the regional transport partnership covering Dumfries and Galloway, to commission an expert pre-appraisal report into improving transport links in the area. Following discussions earlier this year, SWestrans advised Beattock Station Action Group that it would seek to facilitate planning for station re-opening over the medium-term, taking account of the potential for development of a new west coast service under HS2. Group Chairman Martin Brown said: “We’re delighted to be working in partnership with SWestrans to commission this essential report as a vital first step in the evaluation process for the reopening of Beattock Station”. “This has been made possible by the generosity of local residents and businesses with contributions from Annandale & Nithsdale Community Benefit Co. courtesy of ScottishPower Renewables Harestanes, who have contributed towards the report because this is the only way that the Scottish Government will fund the reopening of the station. The response from our communities has been fantastic and we’d like to thank them for their support. 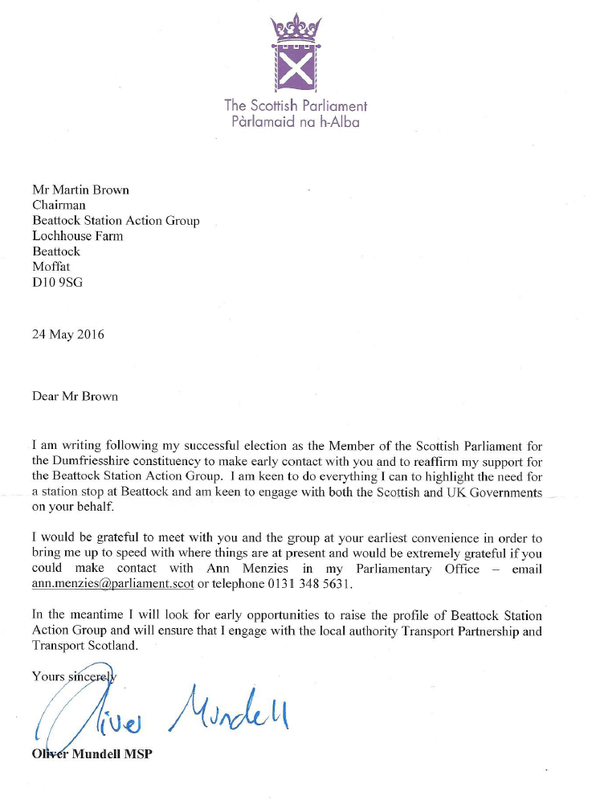 “A station at Beattock would give a massive boost to the local economy and stimulate regeneration. 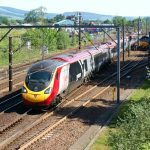 It would transform residents’ work opportunities, with a daily commute to Edinburgh or Glasgow taking only 45 minutes, and make it much easier for people to use the train for shopping or leisure. The report, which will be carried out by transport specialists Peter Brett Associates, will be published early in the New Year. 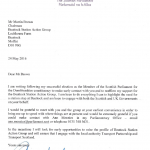 Moffat and Beattock are the focal point for travel, tourism and other businesses in central southern Scotland. 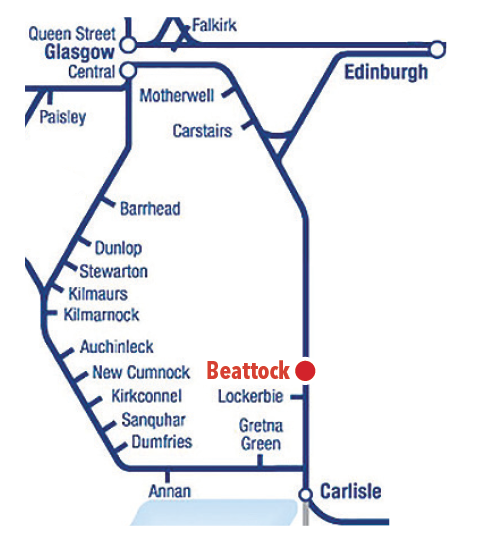 Situated on the West Coast Main Line, Beattock is an important transport hub, in a key location for travel, tourism and other businesses in central southern Scotland. The M74 motorway from Glasgow to the English border at Gretna runs near the line and the Southern Upland Way, Scotland’s famous 212-mile coast-to-coast walk, passes through Beattock, which is also on the National Cycle Network. However, no train has stopped at Beattock, immortalised in WH Auden’s poem The Night Mail, for 43 years. The 48-mile stretch of railway track from Lockerbie to Carstairs is the longest in Britain with no station. It is the view of Beattock Station Action Group that Beattock could be ideally placed to become a park and ride, or Parkway, station. The local community owns land next to the station that could be used for off-street parking. 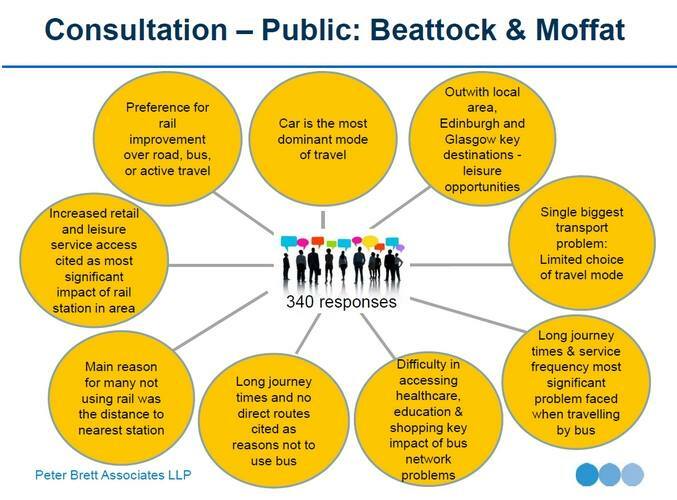 This makes Beattock an excellent option for people from the Dumfries area travelling northwards. The report would be an important step in establishing the feasibility of this. Beattock Station Action Group Chairman, Martin Brown, being Interviewed on Border Television.